Celebrate! 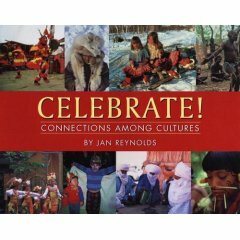 Connections Among Cultures by Jan Reynolds. About: (because it sounds odd to say the Plot for nonfiction books.) A look at cultures around the world, with all continents represented, from Tibetans to Aborigines to Sami. At first glance, the cultures seem very different. Reynolds does not group the photos by culture, tho, but rather by the various ways that different cultures celebrate (gathering together; eating; music) to emphasize how we are similar. The Good: Jan Reynolds is amazing. Seriously. Until this book, my assumption was that these types of books are written by people in offices who use photos other people took and use reference books to write the copy. But Jan Reynolds has actually gone to all these places and taken all these photos (except one on page 11.) How cool is she! A look at her website tells me that she's even cooler than that. She's crossed the Sahara on a camel; she's a Mountain Man Triathlon Champion. I also like how the pictures emphasize how similar people are, yet Reynolds does not shy away from the differences. She also includes cool details, like people who eat roasted armadillo. Or use reindeer hide (probably not a book to read in December). Reynolds does include "Americans," meaning people from the US. Are we really that parade obsessed? And the Bread & Puppet Theater of Vermont dancers with frog heads freaked me out. I like books that have sources and notes; and I liked how at the end of the book their was a map notated to show where the different groups are and additional sources for information on all the cultures mentioned in the book. This book is the first that I've received from Lee & Low, who specialize in multicultural books. And I just noticed that their website has more than books, such as a poem of the week. And classroom guides. This book was also reviewed by Kids Lit and Big A little a.